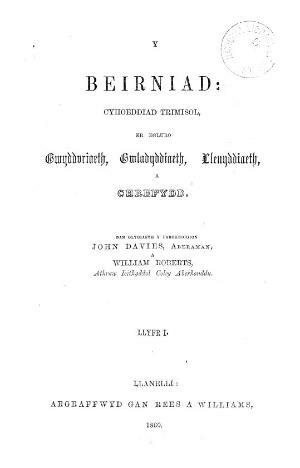 A quarterly Welsh language literary periodical that published articles on literature, science, politics, education and theology. The periodical was initially jointly edited by the Congregationalist minister John Davies (1823-1874) and the Brecon Congregational College tutor, William Roberts (1828-1872), by Davies between 1872 and 1874, and following his death by the Congregationalist minister, John Bowen Jones (1829-1905). Associated titles: Yr Adolygydd (1850-1852).